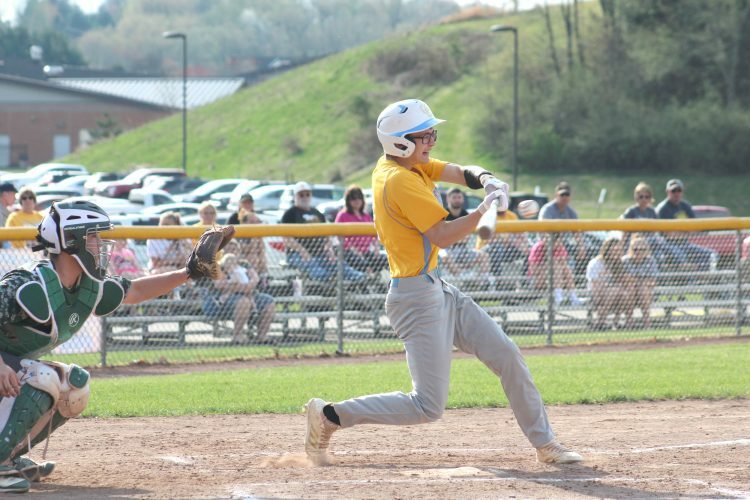 COLUMBUS — Fighting through injuries all season, it was not a given that Beaver Local junior Cole McComas would find his way back to a state championship final. On Friday, McComas, who entered the tournament with a third-place showing at districts, landed back in a championship final for the third straight season by topping Steubenville senior Peyton Blasko 7-4 in the 126-pound semifinal at the 82nd annual Ohio state wrestling tournament at the Schottenstein Center. Blasko had beaten McComas twice earlier in the season. After a scoreless first period, both wrestlers scored a pair of points in the middle period. It was all McComas after that, however. He earned an escape before getting a takedown and being awarded two penalty points in the third period. McComas (43-7) will go for his first state championship today as he is set to wrestle Louisville sophomore Davin Rhoads (40-10) for the title. McComas met Rhoads recently in a matchup during the regional final of the state dual tournament and won by pin in 3:43. “There was a little more pressure on me this year. As a freshman, there’s not really any pressure on you,” McComas said. His coach and brother, Johnny, said there’s always pressure. “This one was a little more special because having been to the state finals twice before and losing,” Johnny McComas said. “He’s been banged up this year early with an elbow injury that caused him to miss a lot of practice. He’s had to work hard to stay in shape and be ready for the end of the season. Cole McComas, who finished second at 106 as a freshman and second at 113 as a sophomore, won his championship quarterfinal earlier in the day by a 8-3 tiebreaker victory over Aurora’s Jack Gorman. Beaver Local freshman Logan Ours had his strong run in the 120-pound bracket hit a speed-bump as he was knocked off by a 7-1 decision courtesy of Louisville sophomore Garett Lautzenheiser in the championship semifinal. Ours (34-5) beat Parma Padua’s Jimmy Balazy by an 11-3 major decision in the championship quarterfinal. He’ll return to action today in the consolation semifinal against West Holmes’ Tyler Masters in his pursuit of a high-spot on the podium. Beaver Local junior Skyler Lasure will place for the third time at a state tournament after he landed in the consolation semifinals at 145 pounds. Lasure (37-7) beat Ravenna Southeast’s Kaleb Dohse with a 6-4 sudden victory in the second consolation round and then beat Indian Valley’s Adam Lenhoff 7-4 in the consolation quarterfinals. Lasure will meet Aurora’s Andy Garr in the consolation semifinal today. East Liverpool junior Sklor Wooley is in a good spot for a high podium position after he advanced to the consolation semifinals at 220 pounds. Wooley (43-9) will take on Norwalk’s Alec Maloney in today’s consolation semis. Wooley pinned Richfield Revere’s Ethan Depp in 4:36 to advance out of the second consolation round then scored a 12-2 major decision over Bellfontaine’s Bruno Pattison in the consolation quarterfinal. Minerva senior Drake Decker will place at state after he scored a 1-0 victory over Sandusky Perkins Max Oprzadek in a 106-pound second round consolation match. Decker (44-14) landed in the seventh place match after a 15-6 major decision loss to St. Paris Graham’s Nolan Gessler in the consolation quarterfinal. Decker will meet Batavia’s Brandon Sauter in the seventh place match this afternoon. Catholic’s Dorian Gridiron 6-3 in the second consolation round and then was pinned in 2:24 by Dayton Chaminade Julienne’s Hunter Johns in the consolation quarterfinals. Beaver Local freshman Mark Emmerling Jr. departed the tournament after winning his opener on Thursday. Emmerling suffered an 8-2 loss to Napolean’s Caleb Hernandez in the 113-pound, championship quarterfinal and then lost a 7-3 decision to New Lexington’s Blake Sheppard in the second consolation round. Emmerling ends his season at 39-14. Beaver Local senior Garrett Givens took a 3-1 loss to Bellefontaine’s Bruno Pattison in the 220-pound second consolation round to end his tournament. Givens wrapped up his final season at 35-10. Minerva junior Ethan Mueller was eliminated with a 9-3 loss to Akron St. Vincent-St. Mary’s Hunter Olson in the 138-pound second consolation round. Mueller wraps up his season at 39-11. West Branch sophomore Kenny Marra bowed out after being pinned in 3:28 by Wapakoneta’s Trevor Plaugher in the 195-pound second consolation round. Marra ends his season at 37-12. In Div. III, Columbiana senior Nathan Whitehead reached the 195-pound consolation semifinals by besting Tuslaw’s Jake Loar 6-0 in the consolation quarterfinals. He’ll wrestle Martins Ferry’s Drake Dobson in the consolation semifinal this afternoon. Whitehead landed in the consolation bracket after he was pinned by Harrod Allen East’s Garrett Neth in 5:56 in the championship quarterfinal. Whitehead ( 34-6) then defeated Columbus Grove’s Dakota Sargent 9-5 in the second round consolation bout. South Range junior Anthony Czap also is alive in the 220-pound consolation semifinals. Czap (47-6) beat Troy Christian’s Nick Baker 8-7 to earn a spot in the semifinals against Patrick Henry’s Will Morrow this afternoon. Czap fell out of the championship bracket after a 3-1 sudden victory loss to Van Buren’s Kaleb Snodgrass in the quarterfinals. He bounced back by pinning Shenandoah’s Dalton Rice in 1:32 in a second round consolation match. Kyle Keenan will wrestle Ashland Crestview’s Dakota Blanton for seventh place at 126 pounds. Keenan (48-8) lost his championship quarterfinal match to Oak Harbor’s Cameron Dickman by a 2-0 count and then defeated Marion Pleasant’s Carter Chase 1-0 in the second consolation round. He was sent to the seventh place match with a 5-1 loss to Newcomerstown’s Gavin Weaver in the consolation quarterfinal. South Range freshman Michael Markulin lost a 16-5 major decision to Pemberville Eastwood’s Brandon Hahn in the 120-pound, second consolation round to exit the tournament. Markulin ended the season at 38-15.